My bees and I live in the northwest corner of Washington state. To the west is Puget Sound (also known as the Salish Sea). The Cascade Mountains rise to Mount Baker’s 10,781 foot summit (3,286 meters), 58 road miles inland. In the north, just beyond the rolling foothills is the Fraser and its expansive valley in British Colombia, Canada. These geological features combine to give us occluded fronts. This means high winds and cold days. In winter we usually get rain (or snow), then a break before another rainstorm blows in quickly. The weather here makes it challenging to raise bees in this area, but this post is about another challenge: staying warm while working winter markets. We do two winter markets: the Fremont Market in Seattle and the Bellingham Farmers Market. The former is outside. The latter is inside a building, but our booth is just inside a glass wall that lifts to the ceiling. The door is happily kept open unless temperatures drop to 28F. I say happily, because more customers come when the walls are open. Warm clothes are essential in both markets. I bundle up for market. Layers are the way to go. They provide space where body heat can be trapped and keep me warm. On the odd chance that the sun should emerge and warm up my world, layers can also be easily shed. My base layers are three pairs of long underwear: silk next to skin, wool above that, then some man-made fiber over that. Then the regular cargo trousers and wool shirt. Of course no one ever sees the trousers and shirt because the layers continue. We were once a fiber farm sold beautiful Irish sweaters along with our yarn and roving from our sheep and cashmere goats. When we became an apiary we had dress sweaters and over-sweaters left from our stock, but too few to sell. I got to keep them, and they have been wonderful for market. I wear one as a shirt and one as a sweater. So far, if you’re counting, that’s 5 layers of clothes on the torso, 4 on the legs. I also bring my parka. I seldom wear it! The five layers keep me pretty warm. By now you’ve probably noticed a theme here: wool (and silk). Natural fibers are amazing. They not only provide space for warm air to be trapped to keep one warm, but they work even when wet (no man made fiber can do this). My devotion to wool is from head to fingers and toes. A wool hat never leaves my head during winter markets. A wool scarf wraps tightly around my neck, and wool socks keep the toes warm. 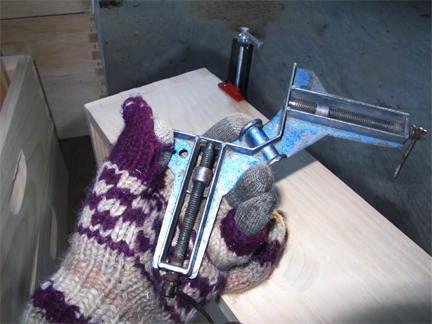 I wear two pairs of gloves – that layering thing again. The base pair are smartwool glove liners. These are wool, but they are thin enough to allow me to make change and restock the table as sales occur. It can be hard to find wool clothing in our area, but because of our background in as a fiber farm, we still carry wool hats and socks at the Fremont Market, so I have a ready supply of those, but not of gloves. It rains a lot here. Wool keeps working in the wet. But it’s best if one doesn’t get wet. So we carry three pairs of shoes to market in the winter: regular daily boots (or sneakers/trainers), rain boots, and snow boots. The rain boots are seldom worn at market and are more for emergencies that occur on the way to market : moving fallen trees out of the way in a downpour comes to mind. Rain boots offer no insulation. I think their plastic actually makes one lose heat. The snowboots are magic, and not because of snow. On a wet and cold day when one has to stay in one place for hours at a time, the thick insulation in snowboots keep this beekeeper’s feet warm and dry. Did I mention that I don’t do cold? I like doing markets. It’s a joy to talk to people about honey and beekeeping. I do this so much better when I’m warm. So although I may look like an overstuffed cushion, I can smile my way through some of the coldest, wettest market days, and continue to share my love of bees with my customers. There are lands, in which I know some of you live, that have other climatic challenges. So, just how do you deal with long market days in high heat? I would think light clothes and lots of water, but do share. That’s the news from Brookfield Farm Bees And Honey, Maple Falls, Washington where I am looking forward to the arrival of warmer spring days. 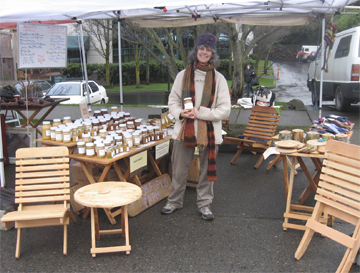 This entry was posted in Bee Business, Marketing and tagged beekeeper, Brookfield Farm, clothes, Karen Bean, layers, Maple Falls, Markets, Washington, Winter, wool. Bookmark the permalink. Thanks for the article on staying warm! I am also from S Cal and alot colder than most other people. Our climate here in SE Alaska (Prince of Wales) is very much like Bellingham. Please tell me how you think bees would do in my area. I would like to consider beekeeping but would be a beginner.